Loaded with sweet, sumptuous flavor. Each nugget gives your bird bite after bite that's jam-packed with sweet apricots, tempting raisins and tangy cranberries. All these tastes work together with other wholesome ingredients like safflower, red millet and hulled oats to create Sunny Orchard Nutri-Berries. All in an inviting berry shape that, time and again, birds have been proven to love. Love it so much, in fact, that 96% of the berry gets eaten. And you'll get a kick out of watching your bird enjoy it. When it's Sunny Orchard Nutri-Berries, every meal becomes a fun-filled festive event. Brimming with nutrition. Though its play value rivals any treat or snack available, Sunny Orchard Nutri-Berries are, in fact, a 100% nutritionally complete meal. That's because every berry contains all the 40 nutrients recommended by Dr. T.J. Lafeber. Nutrients essential to a bird's health. So, cater to your bird's appetite and nutritional needs. Sunny Orchard Nutri-Berries. Bursting with the taste of golden sunshine. Our feathered friends crave savory foods, variety of textures and food shapes that require work to eat. Gourmet Nutri-Berries meet each of these needs. Unlike loose seed mixes, it combines the solid nutrition of Classic Nutri-Berries with fruits, vegetables and other enticing ingredients birds just find irresistible. Your bird knows it is special when you serve Gourmet Nutri-Berries. Dr. Lafeber working with Top Avian Nutritionists, Veterinarians and Behavioral Consultants worked together creating and balancing each Gourmet Nutri-Berries' recipe. They are specifically designed for the nutritional demands of birds: for iridescent feathers, for a strong beak and bones and for bright eyes. Gourmet Nutri-Berries, like Classic Nutri-Berries, combine fresh ingredients, hulled seeds and essential vitamins and minerals, all of which are rolled together into a berry shape birds' love. And to insure our strict quality standards are met, all of our recipes are tested by an independent lab. Balancing the Omega Fatty Acids helps increase immune function. Generally, increased immune function helps the body's ability to fight disease. Gourmet Nutri-Berries are now Omega 3 & 6 fatty acids balanced. Balanced omega 3 & 6's also helps improve the quality of the skin. 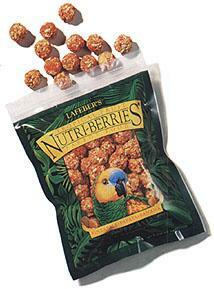 More than ever, Gourmet Nutri-Berries provide excellent nutrition for your loved feathered companion. Our veterinarians and nutritionist determined the best combination of natural preservatives, specifically mixed tocopherols and citric acid, to protect the nutrients of Gourmet Nutri-Berries. Guaranteeing the nutritional quality you and your bird have come to expect from Lafeber Company.